IT’S ELECTRIC⚡! 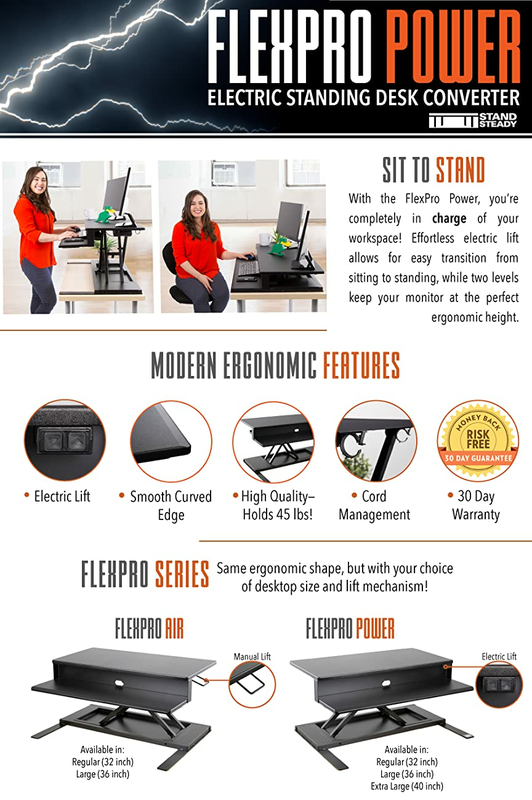 Introducing our most convenient standing desk converter – the FlexPro Power 36" Sit Stand Desk Converter! Can you handle this kind of power? Of course you can...because it raises and lowers with the push of a button. SPLIT LEVEL SURFACE: Places your keyboard and monitors at the right heights relative to each other. That way you enjoy strain free typing and viewing whether sitting or standing. Our 36" version offers a "just right" width that's a little more roomy than the 32" version but more compact than the extra wide 40" model. We got off to a rocky start with this desk. Pulled it out of the box and one corner was damaged as though it had been dropped. And then the box that I needed to plug the cord in had shifted to the middle and was nearly impossible to reach. The only instructions in the box were for the non-electric version so not helpful for me. So far the desk is working ok.
Yeah, no more sitting down ALL day long! I'm writing this review right now from my new FlexPro desk. It works great and was easy to set up and use right out of the box. The height range is perfect. You'll have to buy a foot pad to go with it, though, to minimize strain on your legs if you're standing up for long periods. Don't get a flat pad. Make sure it has bumps and ridges so you can change foot positions throughout the day. I got the Urvigor Standing Mat, Not Flat Anti-Fatique Mat. It's also available on amazon and works great. If you're adding a sit-stand lift to your desk, make it the right one, make it THIS one! I must say that this product represents the best VALUE of any of the similar products that I have seen and/or tried. This unit is a black, Electric lift/lower (which eliminates any back injuries trying to lean-over and lift at an angle like the "soft-shock-assist" models. I have two 21-inch monitors on it plus the keyboard, mouse, stapler, Cross-pen/pencil set, a calculator, and a staple-remover, and yet i still have enough room to lay my legal-pad down for notes! NICE! As for the speed of lifting and lowering? some might think it is too quick or too slow, but here's what I've found: if I push and hold the lift button while with the other hand placing the mat, then by the time I stand up, it is fully raised. Likewise, I sit in my chair and then lower it whilst I put away my floor-mat, and its set and lowered, all without strain or effort. Unit is stable, even when a klutz like me tripped and fell onto it with out-stretched hands while it was raised it didn't spill a thing. All of this for under $300? I was so pleased with how much I saved that I splurged and bought a year-long Prime membership and STILL saved money over the competition. Back issues caused me to research and choose FlexPro Power Electric Standing. The price was amazing low, unlike the $1000 items on TV ads. The package arrived intact and the set-up was very easy right out of the box, no assembly required. The smooth operating is very impressive and gives options for many different levels, as user determines. I am enjoying standing and working on my computer. When I do choose to sit it lowers as easy as it raises and meets my user needs. Pleased with my choice, purchase, and the operating of this item.